However, it was still pretty cold, probably in the upper 50s. This made it fairly uncomfortable to ride anything that moved quickly, so we stayed away from roller coasters and the like. We started off with the overhead gondola ride, which I always enjoy. You get a nice view of the the park, and can see what's busy and what's not in many areas. Then, we headed to lunch. The potato salad was good, the penne was pretty boring, the barbecue chicken was good, the potato roll was plain, and Jonathan said that the hot dogs were okay. It was too cold for me to have ice cream, but they only had ice cream sandwiches and push-pops, so I wasn't missing much, LoL. We wandered around a little bit, then went over to see the Peanuts Pirate Adventure show. I was excited because I enjoy the Peanuts characters and "swashbuckling" in the show description caught my eye, LoL. 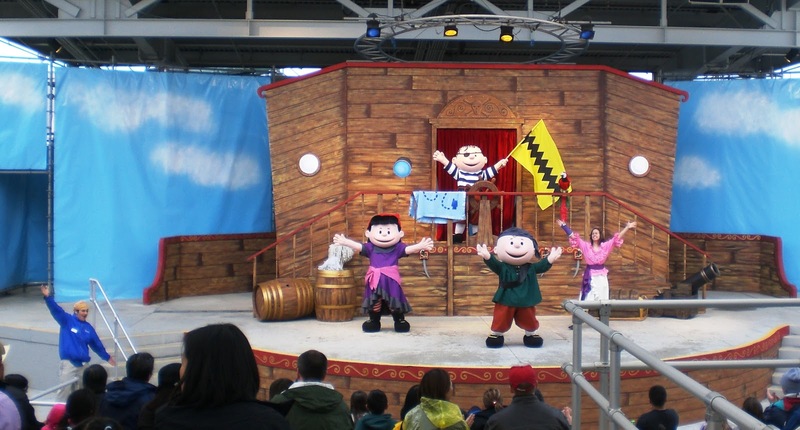 [oh, and sidenote: the park had been bought-out since we went in 2009, and now it's Peanuts-themed instead of NICK-themed, though there are still some NICK rides] I was pretty disappointed. There was no swashbuckling... in fact, there was only a tiny bit of time that swords were even in play. There was no plot, just a few lines stringing together the songs and dances. 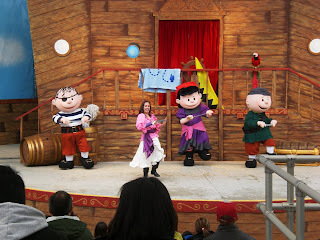 The show was about 12 minutes long, and that's including time for the characters in the show to bring up a dozen or so kids to the stage so that they could swab the poopdeck, LoL. After that, we met up with Eilbroun and Carmen for a few minutes before heading over to the SpongeBob SquarePants ride. We weren't entirely sure what to expect (the map gave no descriptions of any of the rides), but it ended up being pretty fun. You sit in a tall, slightly reclined seat, and seatbelt yourself in before putting on 3D glasses. Then you watch SpongeBob make a krabby patty, but the pickle gets lose and you run across town. The chair shakes and raises and drops and all kinds of stuff - much more involved that the Back to the Future ride in Florida! When that was over, we headed toward the front of the park to ride the two-story carousel. We ended up catching part of the Celebration in the Plaza show, which had more of the Peanuts characters but also a bunch of ribbon-dancers, which was strange. We had originally planned to meet back up with Carmen and EB to ride the Star Tower as a group, but they were still in line for Grizzly, the park's wooden roller coaster (which also happens to have the WORST safety rating IN THE COUNTRY). So, we went on it without them. I always enjoy those types of rides - you slowly revolve as you rise higher and higher, until you're at the top and revolve a few more times before starting to come down again. We tried to pick more rides to go on, but with the weather being cold and windy, we just weren't feeling it. Plus, several things were opening and closing with the rain, so we didn't want to go to one area just to find out that something is closing, or worse, stand in line for twenty minutes only for the ride to close before we actually got on. It was a pretty low-key day, but it worked. I think the most interesting thing is that the Invertigo, which I mentioned both other times we went to Great America [oh yeah, we went last Halloween while house-hunting, too], is now gone. Like, completely ripped out, and only dirt remains where it once stood.